5th release in a series of unique, ''mini 45 RPM albums''. Features a special verse from Jay-Z's long lost St. Ides commercial from 1997. Mark James (AKA The 45 King) is a world-renowned DJ/ Producer pioneer in Hip Hop. His breakbeat classic ''The 900 Number'' has been a staple among DJs since its release in 1987 (notably featured as the song to ''The Ed Lover Dance'' on MTV's Yo MTV Raps). 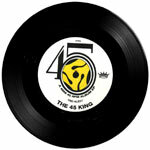 ''Red Alert'' is the 5th in a series of unique, ''mini 45 RPM albums'' featuring 45 King's signature sound; breaks chopped and looped to perfection. This 7'' features a special verse from Jay-Z's long lost St. Ides commercial from 97 among other funky beats and breaks.